Windows 10 disk cleanup is necessary since the hard drives are often somehow filled up very quick, which cause the system laggy. What’s the best way for cleaning up computer Windows 10? There are too many folders to find and check by hand, while deleting important system files may cause malfunction. In fact, Windows 10 provides a wonderful feature to do that. 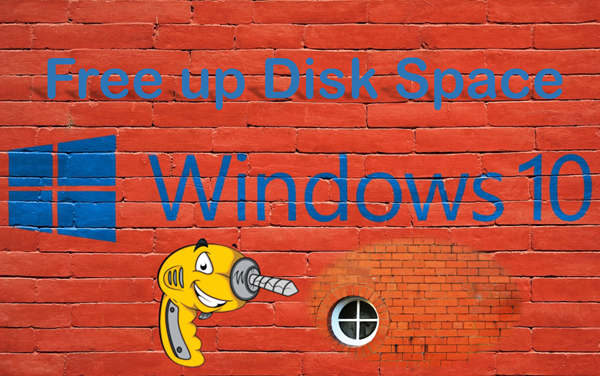 In this article, we’ll learn to free up disk space Windows 10 and speed up your computer. 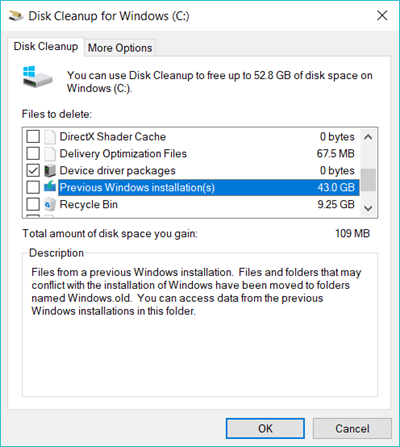 Windows 10 has a built in Disk Cleanup tool. It can detect disk space that you can free up with little risk. Step 1. Input “Disk cleanup” in Windows 10 search bar, then click Disk cleanup to open it. Step 2. Select the drive you want to clean up. Step 3. Look through the list under Files to delete, and tick the items you want to delete. You possibly can only find available space on the Recycle bin of the selected drive. Step 4. Click OK to apply the cleanup. If you want to free up more space, please clean up system files. Step 1. 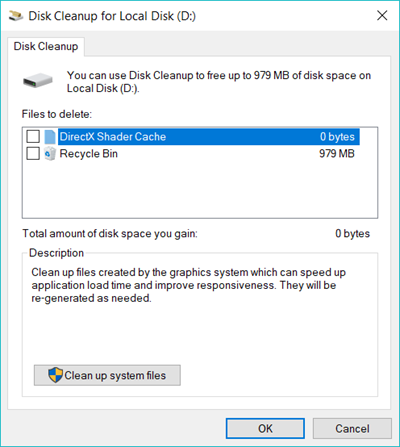 In Disk Cleanup, click Clean up system files. Step 2. Select the system drive in your computer and proceed. It will take longer to analyze. Step 3. Now you can find more items under Files to delete. Click every item and read Description to make sure you know what it is about. For some items, you can click View Files to open the location directly. Step 4. Tick all the items you want to delete, then click OK. 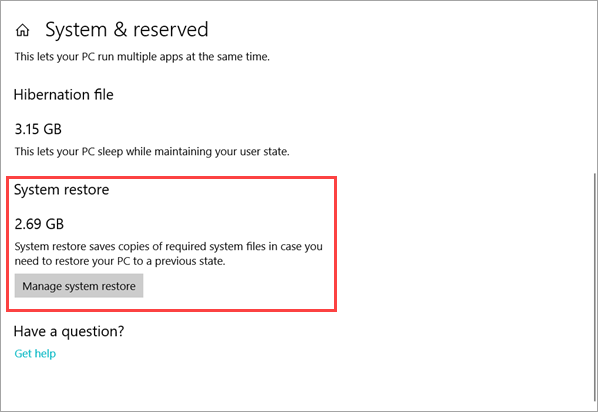 Note: Recycle Bin and Previous Windows installation are often the biggest monsters of space, but you should carefully decide in case you will need to recover files emptied from Recycle bin or find go back to an earlier build missing. You find it, right? Windows 10 Disk Cleanup tool only shows temporary files and other fixed items that it can detect and define. In real life, we have many more files that can be considered useless. Everyone has his/her own definition for useless data, but you must need some assistance to find the files quick. Let’s see an analysis of your Windows 10 disk space usage first. 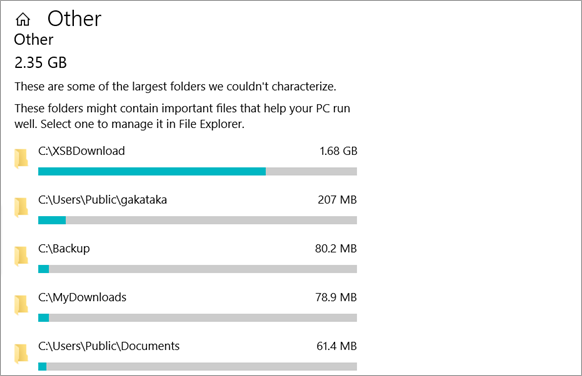 On Windows 10, Storage function allows users to clearly view what is taking up space on their Windows 10 hard drives. It is better than Windows Disk Cleanup app, which mainly focuses on temporary files and Recycle bin. See how to get to the feature. Step 1. Click the Start menu on bottom-left corner. Step 2. Choose Settings > System > Storage. Step 3. Click to select a storage partition. Step 4. View the storage usage. On the storage usage screen, you’ll know the disk space occupied by System & reserved, Apps & games, Temporary files, Documents, Pictures, Videos, etc. These are basically all the available options to free up space from on Windows 10. In the next part, we are going to show you which items are included in them and how to safely clean up the occupied space on your Windows 10 computer. Please note that the exact layout may slightly vary on different versions of Windows 10. System & reserved is usually at the top of storage usage list, but they have very limited room for us to free up since these are mainly system files and reserved memory for special tasks and conditions. The only juice we can spare out is from system restore points, which you may have set in order to restore files on hard drives to an early version from unwanted system change. It is up to you whether to delete them or not. If you have trustful backups elsewhere, you may delete system restore points by clicking Manage system restore > Configure > Delete. Once you delete them, it is impossible to get them back. In Other category, there are some of the biggest folders that the system couldn’t recognize. They are mostly the folders that you use to save files for work, multimedia or games. Some of the big folders may have no use for you already and you forget to remove them from your Windows 10 computer. Now, it is the time to do it. Just click any one from the list and it will opened in File explorer. Make sure that you have checked each folder before cleaning. Even though the deleted files will go to Recycle bin, you might empty Recycle bin in next steps or in the future. Apart from big folders the system detected, you must have many big files in unknown folders of your Windows 10 hard drive. Here is an easy way to find out files with the size over 128 MB. 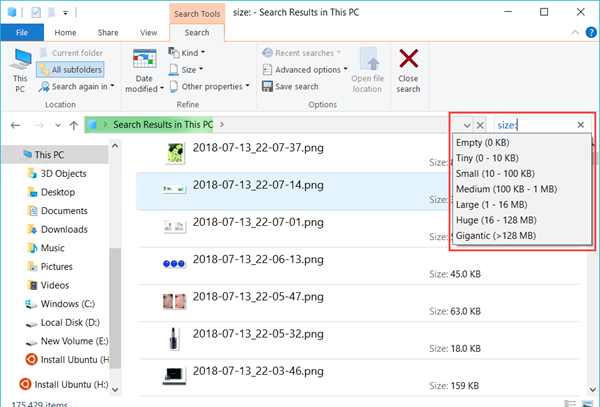 Open File explorer on your Windows 10, type size:gigantic in the search bar. The system will start filtering automatically. Just wait it to finish, and then delete the files you don’t need anymore. If you find one media file, usually you could find more similar files by choosing Open file location in right-click menu. Tip: If you want to filter out files of smaller size, just replace gigantic with huge (16 – 128 MB), large (1 -16 MB), etc. It would be better to move those big folders and files elsewhere, like external hard drive, in case you have to recover permanently deleted files from your Windows 10. Apps and games may be the first items that you want to delete when you find your Windows 10 Drive C is running out space. You can uninstall them through various paths. However, the problem is that it would be a pain to uninstall the apps and games that you love. Actually, Windows 10 allows us to remove optional features, including typing methods, fonts, speech to text, IE, Windows Media Player, etc. 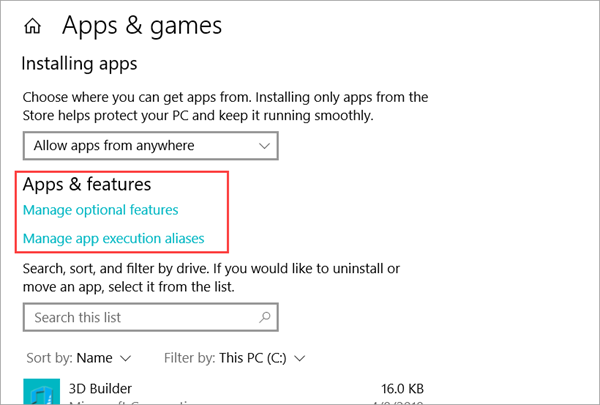 These features are mostly pre-installed for facilitating your usage on Windows, but not always necessary. Click Apps & games > Manage optional features and choose the items you don’t need and uninstall. Some of them take up quite a lot of memories. In case you regret, just click Add a feature to recover. As a matter of fact, Documents, Music, Pictures and Videos here don’t mean all such kinds of files on your Windows 10, but only those in the default folders with the same names, which are usually in the system drive. You can either wipe them out or move them to another place outside of the system drive. If you have custom locations to store your office documents, songs, pictures and movies, you have to find and delete them manually. The small trick on option 2 should help you find out big document and multimedia files quicker. 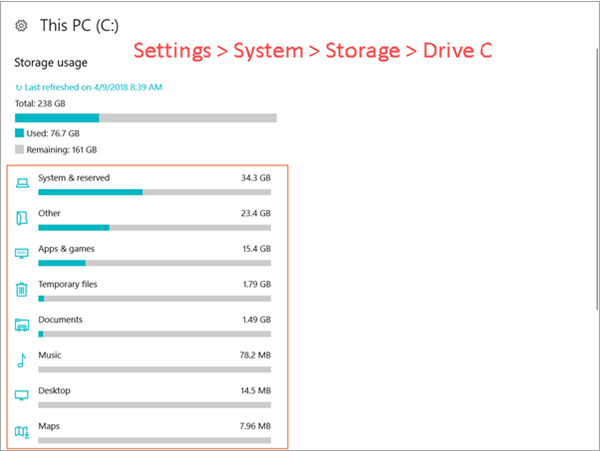 Now you should know how to free up space on Windows 10 computer efficiently without software. It is suggested to do it carefully in your laptop or desktop. In case you delete files and regret in the future, you may be able to get them back with the help of a file recovery software, which also works for USB and SD card file recovery on Windows and Mac.